The mani I am sharing today is far from perfect but in my defense, I threw it together in about 15 minutes before I had to leave for a birthday party. I think considering how fast I did it, it's pretty damn cool! The main color is a new Icing polish I got recently called Too Hot To Handle. I only did 1 coat because of my time constraint, and it covered pretty well. I'd definitely do two next time if I have more time. 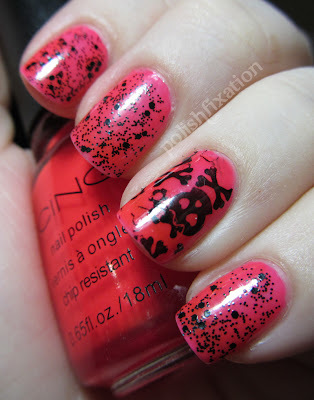 I then stamped with Wet N Wild Black Creme an image from my new DRK-A large stamping plate. It's such an awesome plate! I messed the stamp job up a little bit but that was my error, not the fault of the plate. I added LA Girl Glitter Addict in Uninhibited to finish off the look. This mani actually got a lot of compliments at the party I wore it to, so I think that means all-in-all it was a success! Do you love neon polishes like this one as much as I do? What do you do when you have to do a mani in a short amount of time? Stay Tuned today for when I announce the winner of my 750 follower giveaway! LOVEEE!! Hot pink and black are one of my favorite color combos, so this is perfect!